It was March 6th, 2008 when I did my first "hike", up to the top of Lēʻahi, otherwise known as Diamond Head, the iconic crater that forms the skyline of Waikīkī. From it's summit, I saw the cityscape in it's entirely. 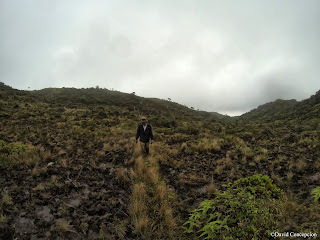 Then, my eyes shifted towards the mountain range that dwarfs the urban city sprawl. My curiosity got the best of me. What was up there? There was only one way to find out. It was August 19th, 2008 when I hiked the Na Ala Hele state trail of Kuliʻouʻou and saw the windward view from the top of the Koʻolau Mountain Range for the first time in my life. 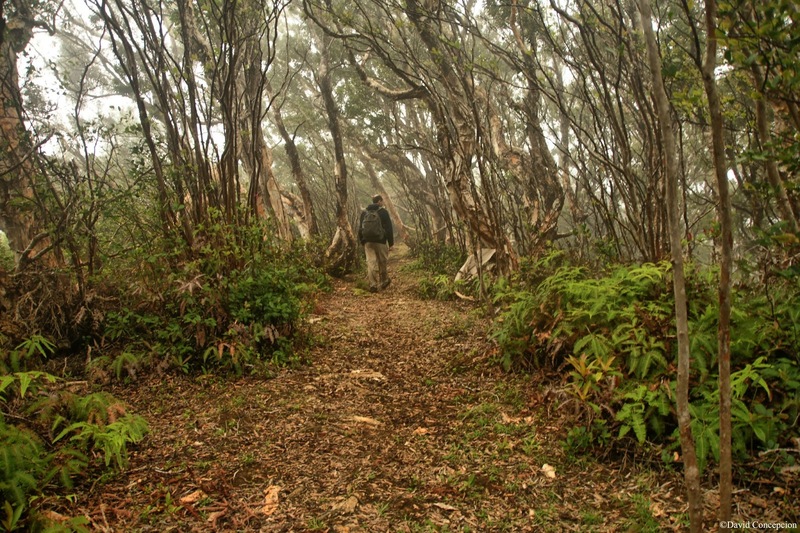 I eventually acquired Stuart Ball's "A Hiker's Guide to Oʻahu" and would continue to hike more trails up to different spots of the Koʻolaus. 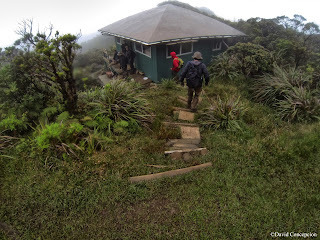 The views were majestic from every point of the mountain range. But I've noticed that there seemed to be a trail that went either left or right of each summit point of their respective trails. 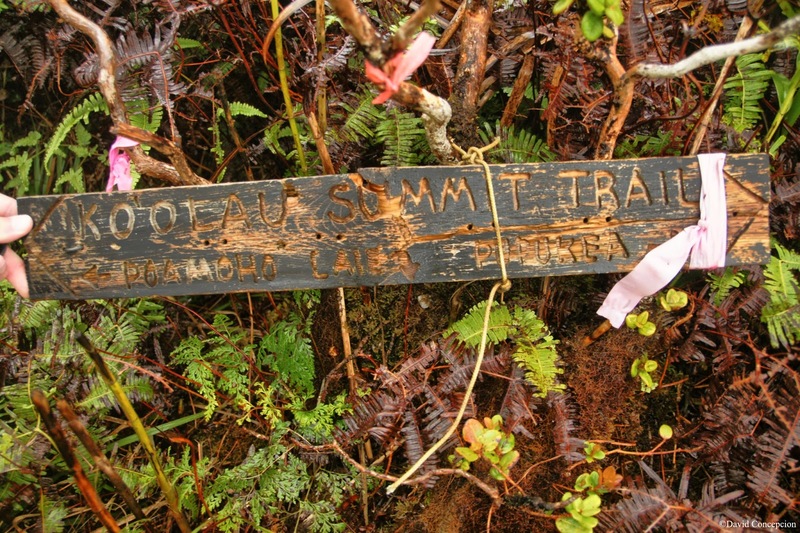 I began to wonder, could all of these summit points be connected by way of what I've learned was the summit trail? 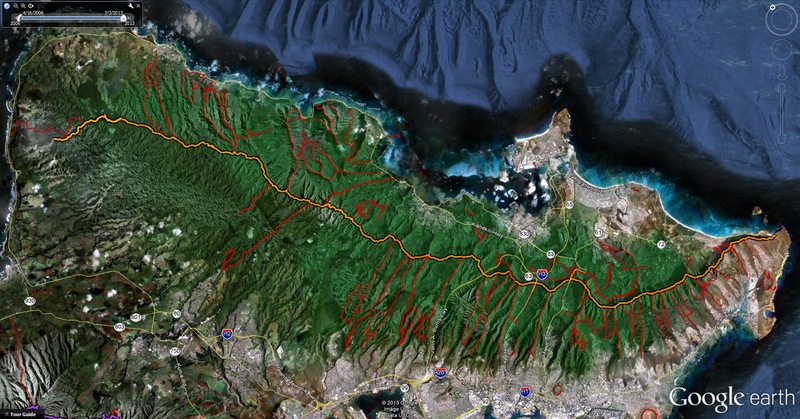 I began to research this summit trail and found virtually no documentation on the internet, except for a few old OHE (O'ahu Hiking Enthusiasts) articles with some film photographs that were scanned to digital. 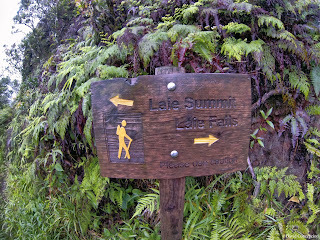 I would soon discover Kaleo Lancaster's "Island Trails" blog with some information regarding the summit trail. 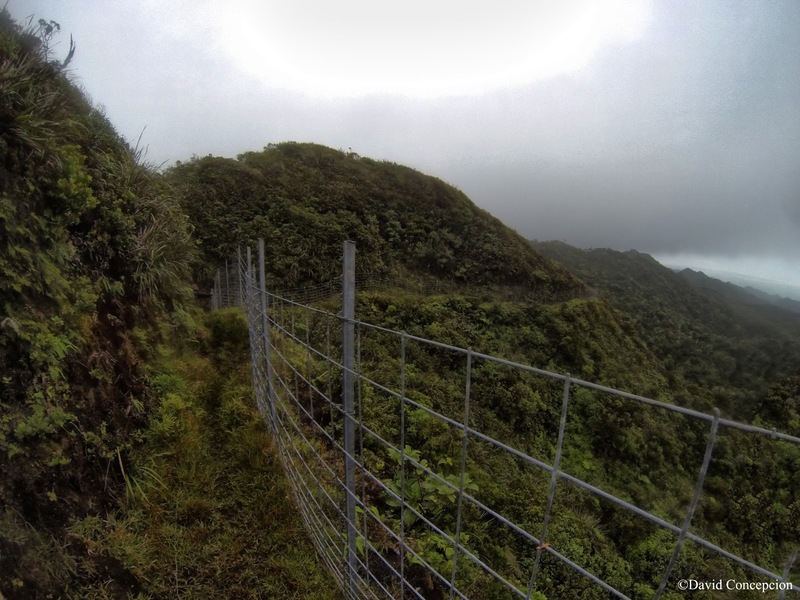 But overall, the entire summit trail from Pūpūkea to Makapuʻu was very little documented. I wanted to change that. 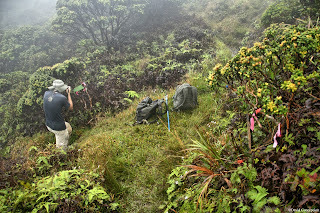 I began my personal quest of section hiking the Koʻolau Mountain Range. I started by connecting the southern portion of the range from Konahuanui to Makapuʻu. 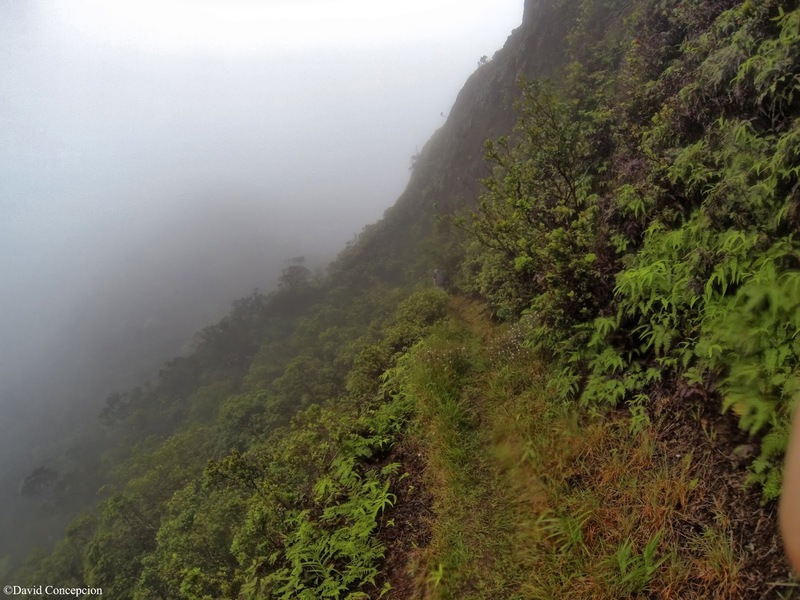 It was then I would learn of the three Koʻolau saddles, the most dangerous portions of the entire mountain range. 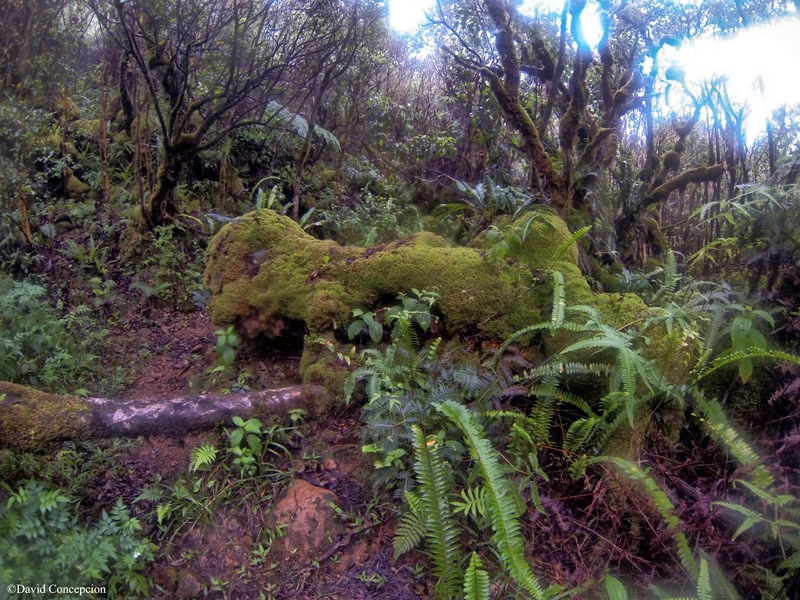 There was one saddle that was virtually undocumented, the infamous Kalihi Valley Saddle or Kalihi Saddle for short. 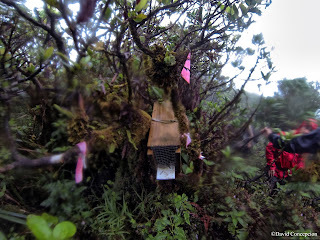 As I made more friends in the local hiking community, we would set off to pioneer these saddles and document them in full detail for the future generation of hikers to come. 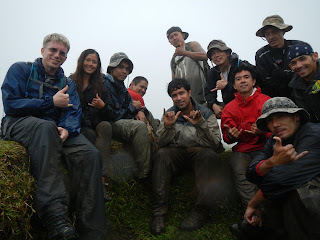 It was during the summer of 2011 when Marcus Griego, Jeremy Kreis, Michael Loftin, Rhonda Hutchinson, and myself became the first group of hikers to successfully traverse and document the Kalihi Saddle in it's entirely, at least during modern times. 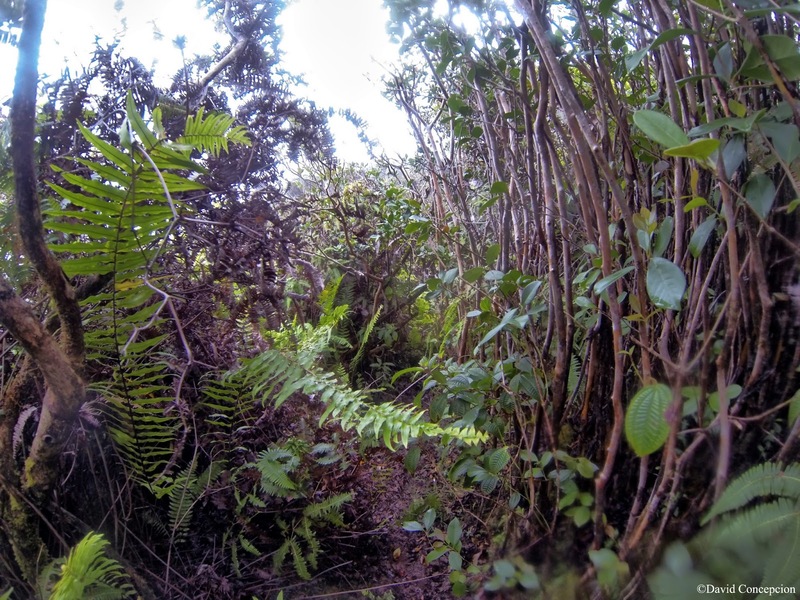 All I had left to do now was document the northern Koʻolaus. 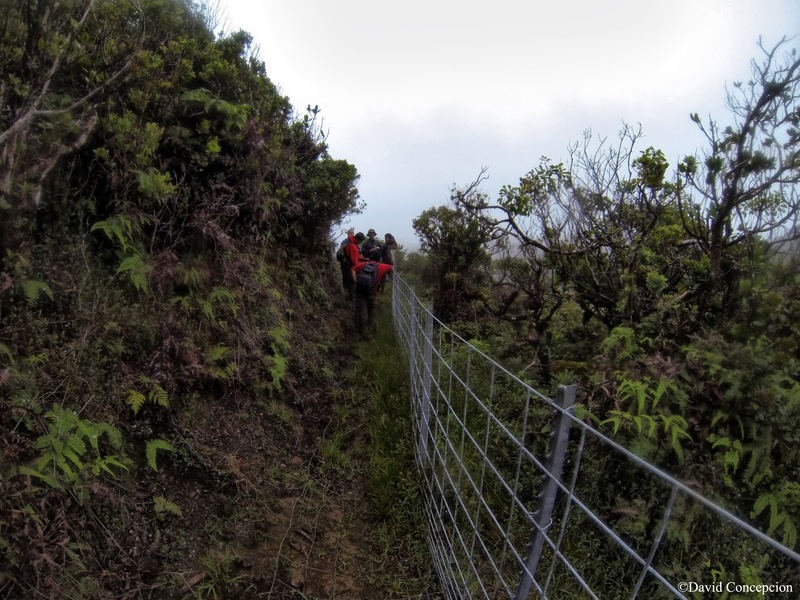 This area requires a lot of planning as the connector trails are much more scarce and the Koʻolau Summit Trail itself is very overgrown to the point of it not being discernible. 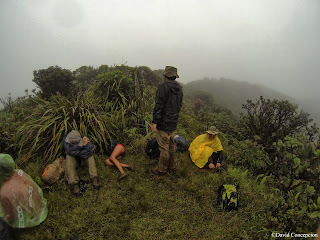 Also the topography is nothing but rolling hills everywhere you look, making navigation very difficult. 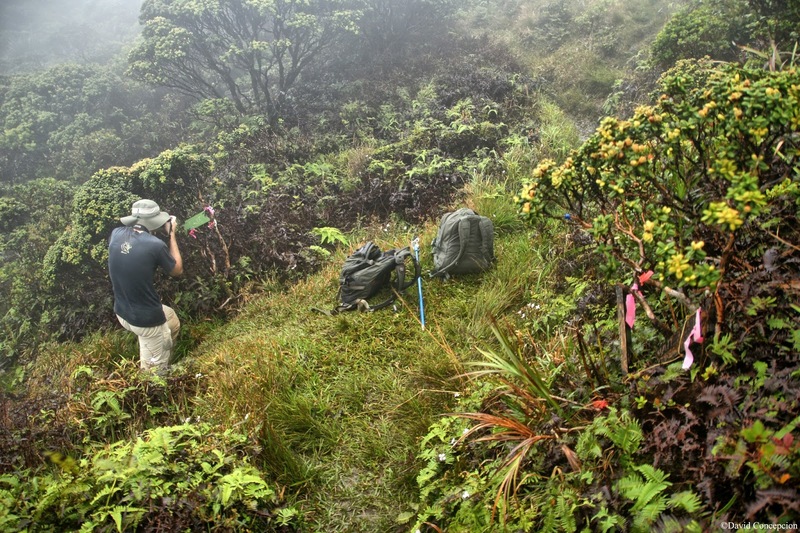 Once I had all the connector trails and the distance between them via the KST analyzed enough, my hiking friends and I proceeded to successfully section hike the remainder of the northern Koʻolaus to become among one of the first pioneers to traverse and document the Ko'olau Mountain Range from Pūpūkea to Makapuʻu. On July 11, 2009, I did my very first Koʻolau summit traverse from Moanalua Middle Ridge to the Haʻikū Stairs. 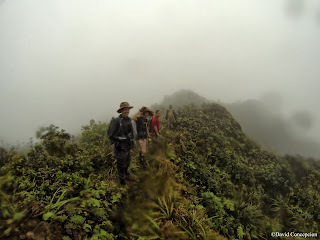 On May 5th, 2013, I did my very last Koʻolau summit traverse from Castle to Laʻie to complete the entire summit spine of the Koʻolau Mountain Range by section hiking via connector trails. 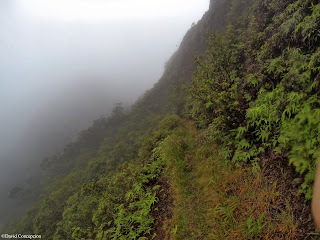 Below is a list (sorted by date) of every single hike I've done to "connect the dots" on the Koʻolau summit spine from Pupukea to Makapuʻu. Some of these may overlap one another so take note of that when comparing these on a map. Compilation of every single segment hike done. Each clip is accompanied by it's aerial view! 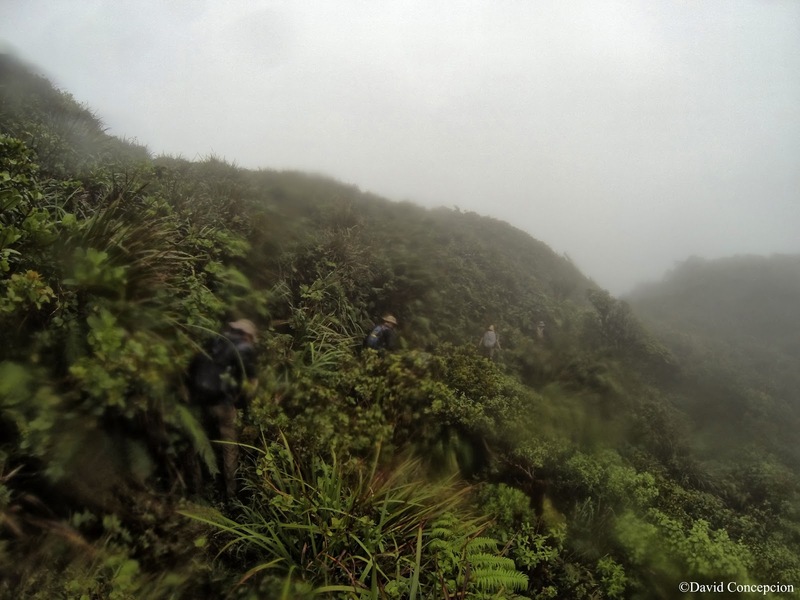 The final leg of this 3 and a half year journey to complete the Ko`olau summit in it's entirely happened on this day, but it wouldn't come without a battle. And what a battle it would be. In fact, this was going to be so epic that I've enlisted quite a few experienced individuals who have joined me over the years. Along with that, I would get to meet several new faces as well. I've put together such a big hiking army, that this day would virtually be my Ko`olau version of D-Day at the Normandy Beach. 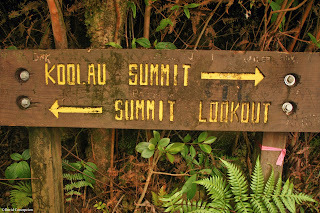 We would definitely prove that 2 or more heads are better than one as this final segment of the Ko`olau summit would probably be the most confusing of them all due to a sheer number of side trails that branch off in every direction. We got together at around 5 at the 7-Eleven in Hau'ula after staging cars at the La'ie Trail. But after some unexpected delays, we didn't push off until 5:30 or 6. Up we went on the long roller coasting trail of Papali Ridge. The morning sun was lighting up the skies around us but as we went further up, the thick cloud decks were obscuring the entire Ko`olau summit. I had a bad feeling that this would be a repeat of the weather conditions when I did La'ie to Pupukea the month before. The Papali Ridge Trail intersected the Castle Trail and we followed that up to the junction with the Ko'olau Summit Trail. 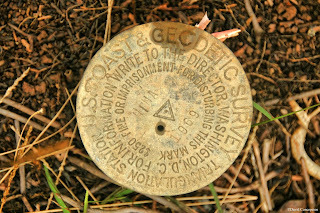 It was around 11 or 12 when we topped out at the Castle Trail terminus, marked by a rusted metal stake and a plastic PVC pole. The weather was already deteriorating so we wasted no time and pushed off towards La'ie. Things were uneventful. 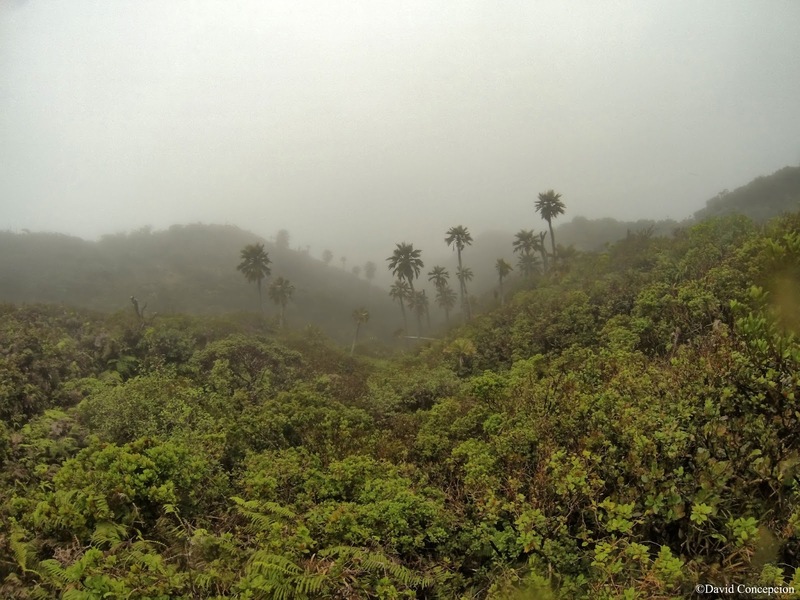 It was typical socked in white out conditions on the KST. 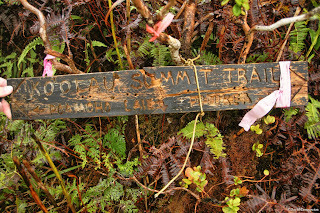 However it wouldn't be long before we would lose the summit trail and it wouldn't be the last time either. There are so many junctions that it is very easy to get disoriented and possibly lost. It didn't help that we didn't have a view so everything looked the same around us. 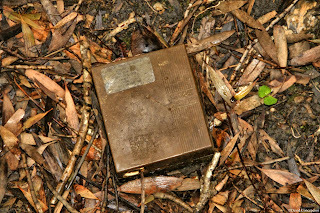 I recalled us getting disoriented at a rat trap area. 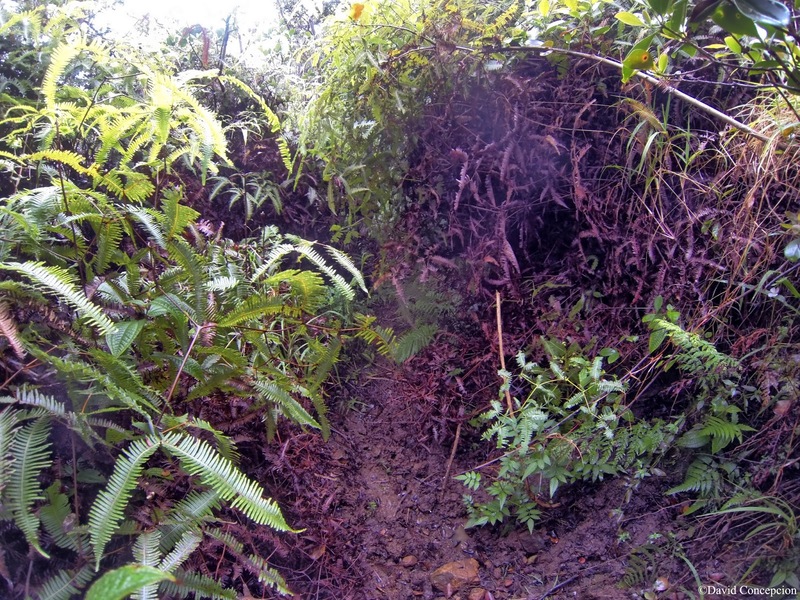 The trail kept going but then simply vanished. Since we had a huge group, many of us ventured off in every direction to scout the surroundings. It probably took around 15 minutes before we realized that we missed an obvious junction to the left just as rat traps came into view. We soon rediscovered the KST and continued on our way. 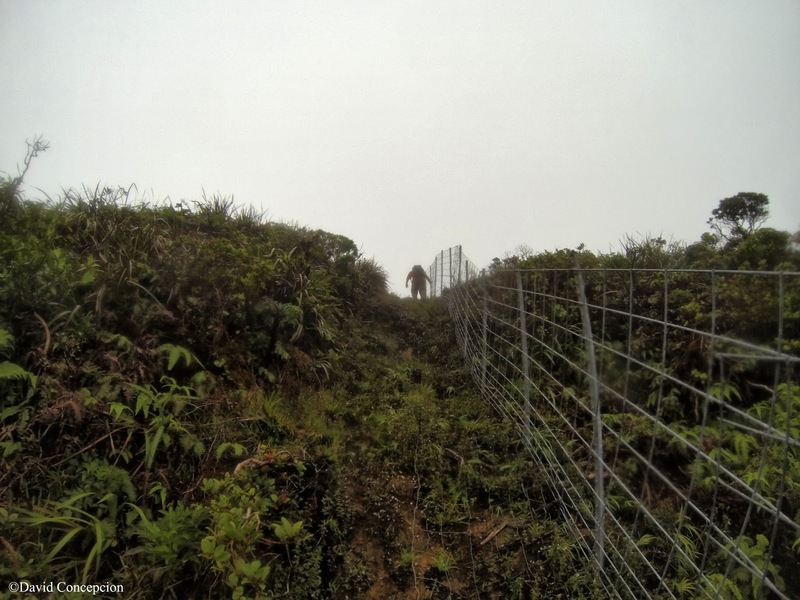 A few hours passed and navigated through a couple more junctions before coming upon the fence. 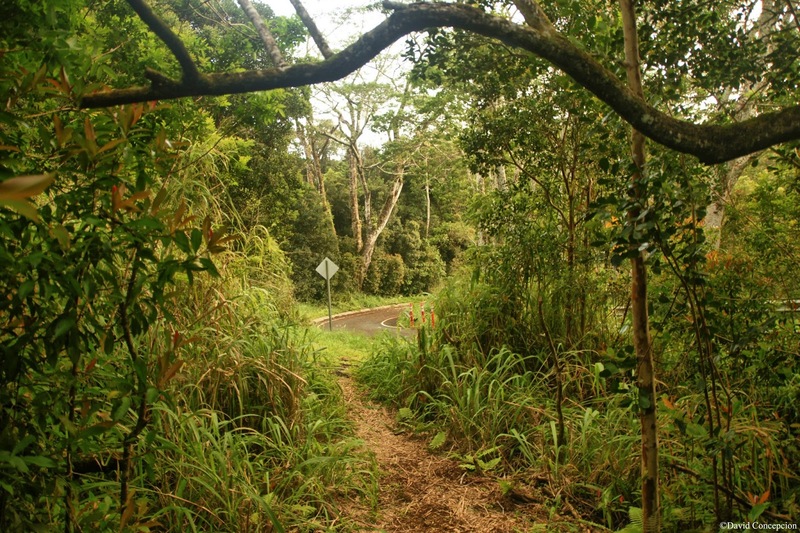 We followed it for some time when we encountered the Koloa Cabin. This was the best cabin I've seen yet. It was even fully provisioned with canned goods. But we were on a timely schedule so we skipped the meal and proceeded on. 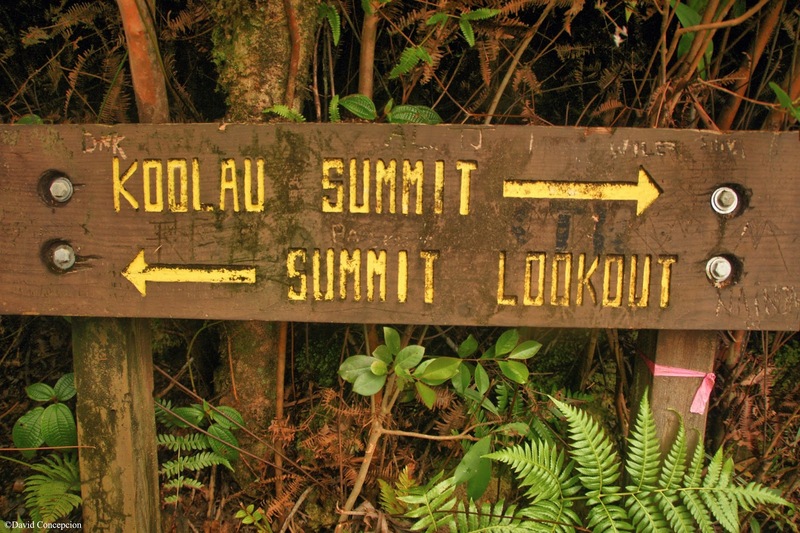 A few more hours and the Ko'olaus will be mine, this thorn finally out of me! 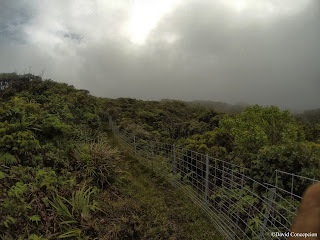 We continued along the fence line and we were treated to a brief view of the La'ie coastline as the clouds lifted up. It didn't last long and we were back in white out conditions. We would be set back once again when we came across a critical junction. The KST and fence line diverted away from each other. 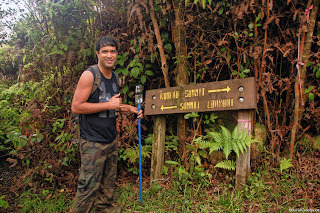 Go left and keep on the trail? Or go right and keep following the fence? We saw a pink ribbon on the fence. We opted for the latter... ::GAME SHOW BUZZER SOUND:: WRONG! 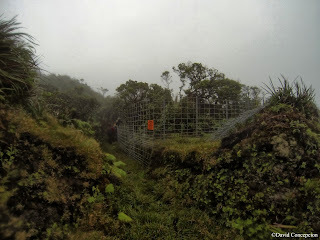 We ended up losing a half hour for that when the fence started to drop steeply windward. 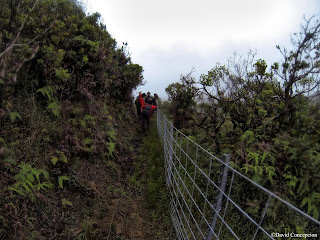 We backtracked to the junction, took the pink trail tape off the fence, which is misleading, and moved it to a brush on the trail. 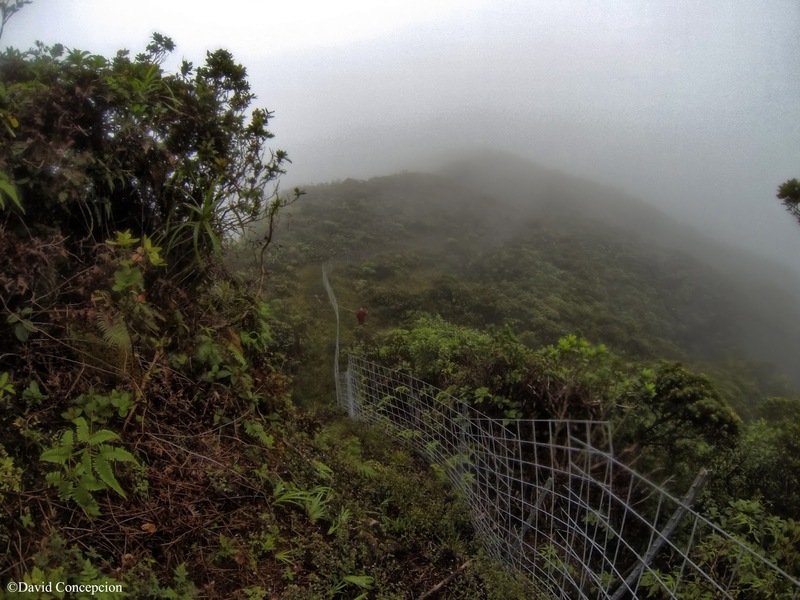 Keep left on the trail, not the fence on the right! From that junction, you should no longer be following the fence. 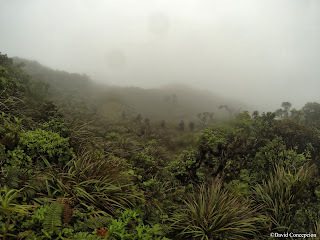 The clouds were beginning to thin and visibility was improving rapidly. The next thing we encountered a short while later was a place that I've seen before... A place where it threw Andrew and I when we attempted this route but instead went to Pupukea! It's was that swampy marsh! On the next hill ahead of us was the foundation of the Kawailoa cabin and helipad. 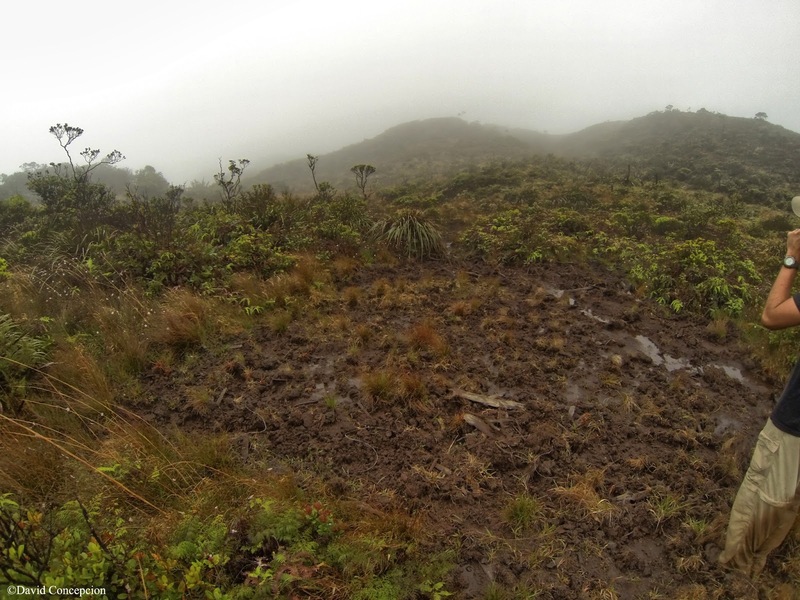 The KST kept to the left side of the marsh, contouring the hill which is just above it, and gradually descended to place us in a small gully that is leeward to the marsh. We crossed the marsh and reached the grassy spot where Andrew and I turned around. 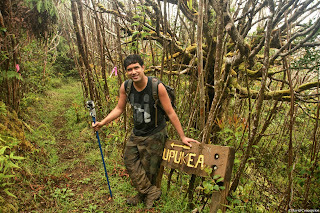 I would technically complete the Ko`olaus at this very spot but didn't celebrate until we got to the La'ie summit. Since we were back on familiar territory, I told everyone where to go and we would be at the terminal point in about 15 minutes. 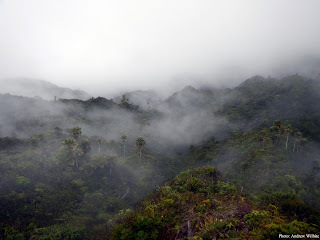 As we made our way, the clouds finally lifted up, revealing everything around us, including the windward coastline. The first thing that stood out to me was the fact that the entire Ko'olaus was very broad, a flat profile. 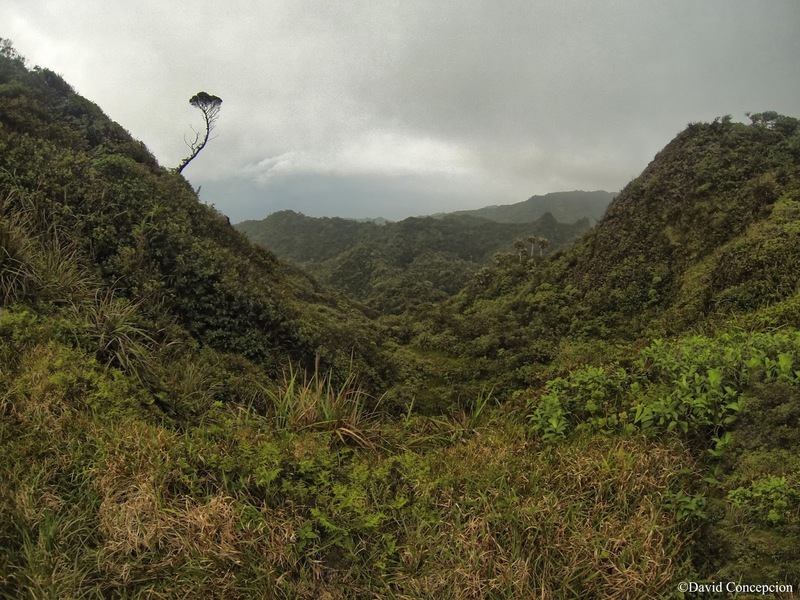 This isn't like the south Ko'olaus where a distinct windward drop is present. The KST practically goes around all the rolling hills in this area, hence one could get lost easily in this section. We reached the foxhole at around 6pm. As I made my final steps, somebody yelled out "You've completed the Ko`olau Summit!" I was too tired to even respond so I threw my two fists into the air and plopped my okole down. High fives were exchanged amongst the crew. The journey was finally over. We didn't stay too long. We were rapidly losing sunlight and the rain began to fall so the faster guys booked it down the La'ie Trail. The rest of us would stick together as darkness enveloped us. 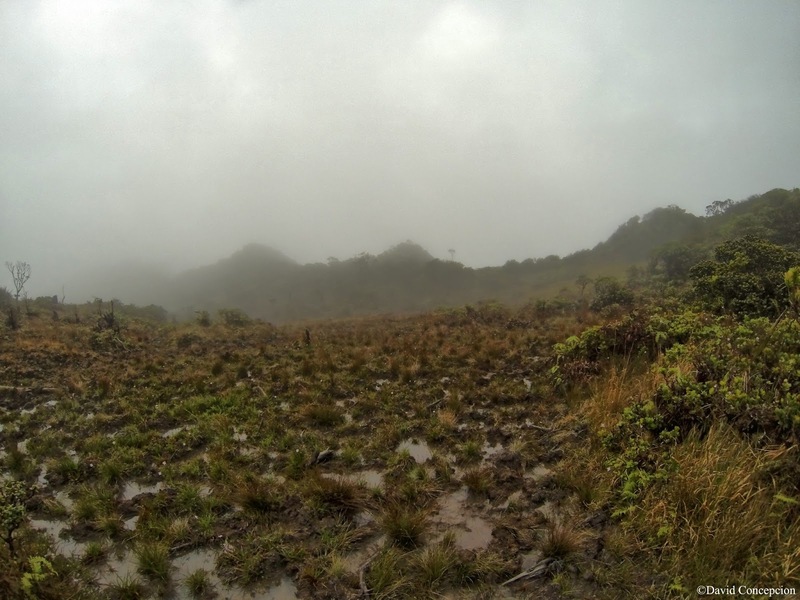 It was raining for much of the way until we reached the dirt road. The road was wet so it made for some slippery footing. We could see some of the water trickling down the lowest portion of the dirt road. 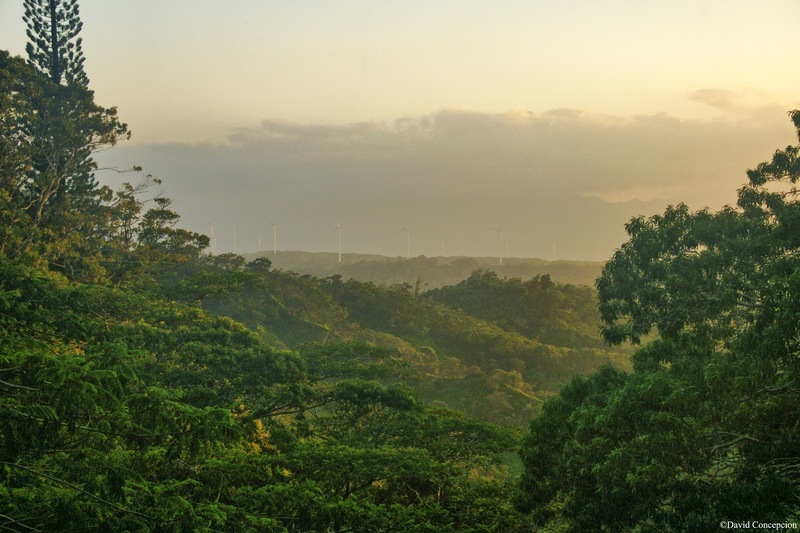 Up in the distance, we could see Kamehameha Hwy and all the brightly lit light poles. After some 14 hours on the trails, we reached our cars. The thorn was gone at last and I let out a sigh of relief. It's crunch time. With the momentum of achieving my personal goal still strong as a brightly lit torch piercing the vastness of the Ko`olaus, I wasted no time in scrambling together the second to the last segment of the entire summit spine. 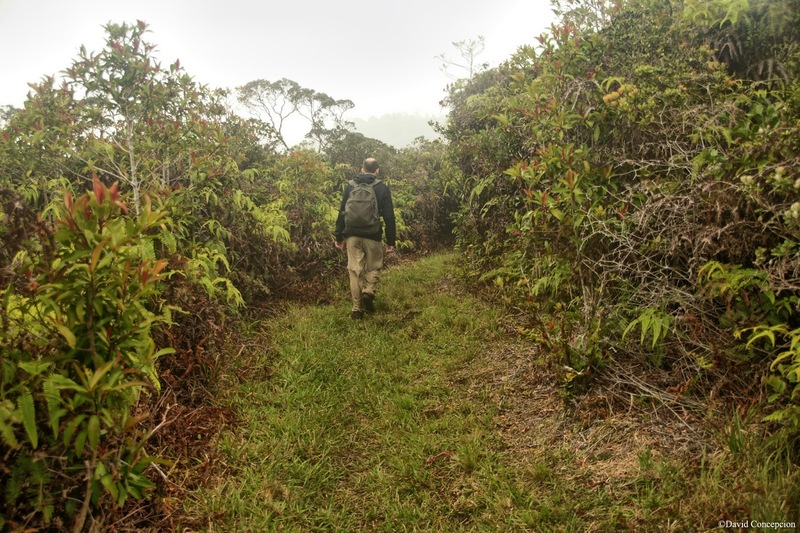 Joining me would be Andrew Wilhite of Punynari's Island Adventures. 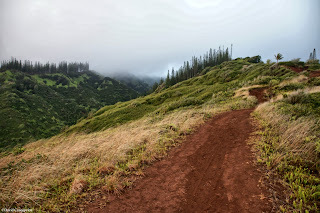 The original plan was to actually gain the summit of La'ie Trail and cross over to the Castle Trail via the Ko`olau Summit Trail and then descend to the point where the Papali Ridge branches off the Castle Trail. That trail would have lead us back to Hau'ula, where we staged a car there. There are numerous accounts of people of losing the KST in this segment. Unfortunately, our excursion would be added to that seemingly growing list. 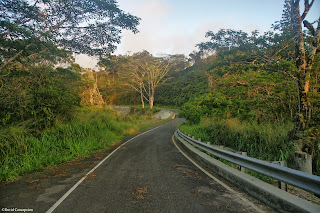 We pushed off the La'ie trailhead at around 5am. Since this was my first time on this trail, I made sure to survey my surroundings a little more than what I usually do with connector trails. 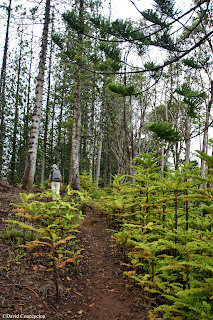 The trail is quite pleasant until beyond the norfolk pines. 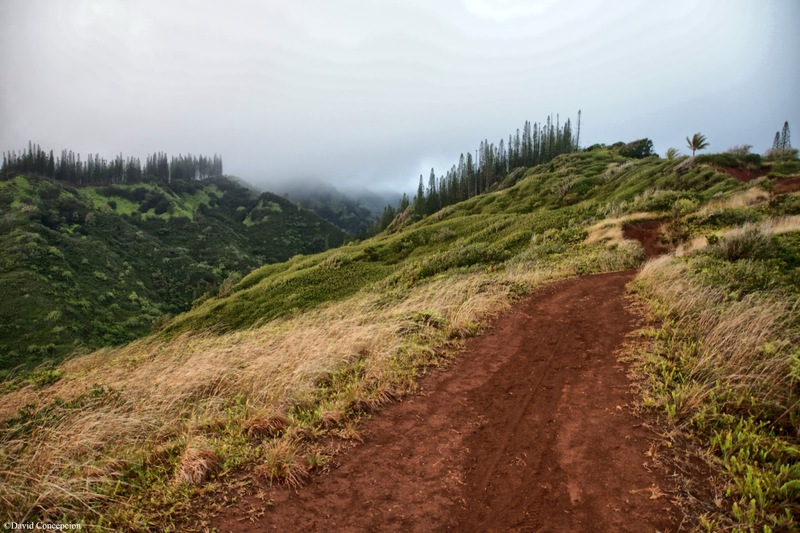 Beyond, the trail narrows to a graded footpath that meanders it's way to the Ko`olau summit. About 2 hours in, we came across the junction to the La'ie Falls. The majority of traffic usually goes to these falls, a place I have yet to do. 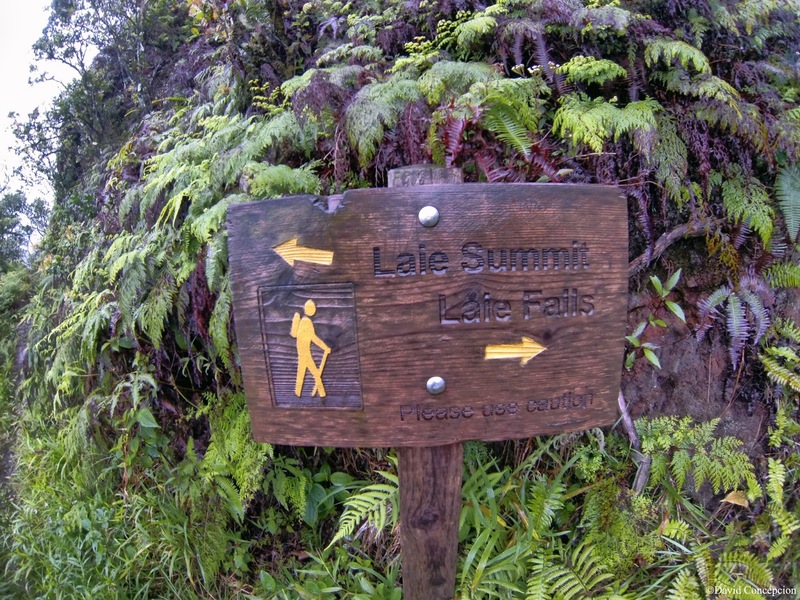 The infamous "La'ie 18 Falls" also ends here, another hike I have yet to do. The clouds were still thick just beyond the waterfall sign. Rain began to pelt us and would remain this way for much of the day. 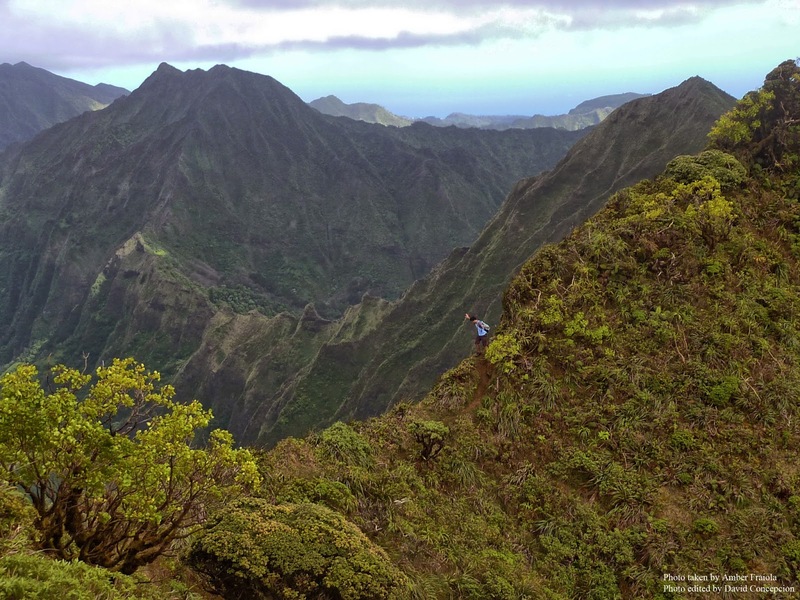 Beyond, the trail transforms into the usual native Ko`olau experience as one hikes closer to the summit. While the La'ie Trail is only 5 miles, it felt much longer than that. 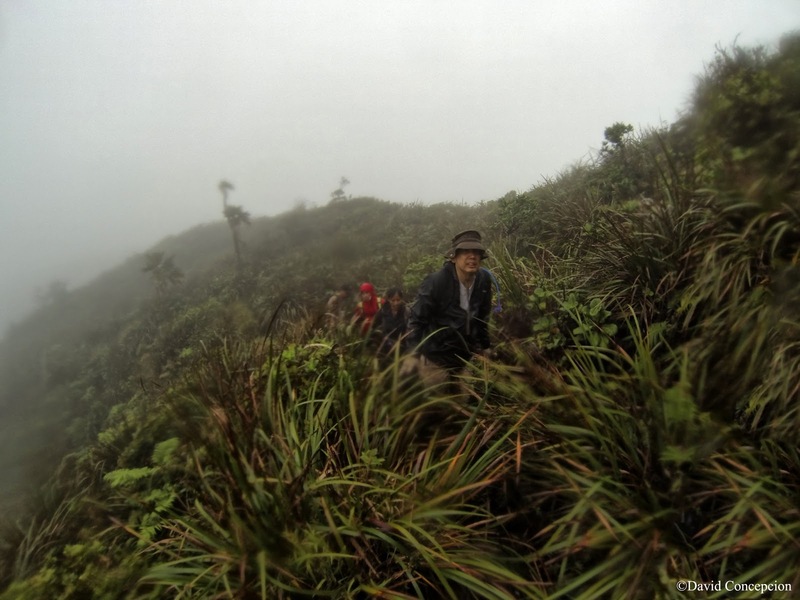 At this point, we were hiking in white out conditions. I started getting concerned that we would be hiking in this white soup for the entire summit stretch, which would prove true as the day went on. We also passed Dave Fahrenwald's "Moose" near the top. 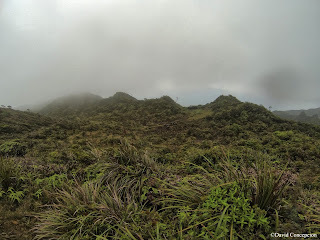 At the summit, we plopped down, rested up, took some photos of the immediate surroundings, the backdrop obscured by the clouds. We then pushed southeast along the KST towards Castle. After about 15 or 30 minutes, we came across a very strange, swampy, flat area. It was filled with mystery as the socked in conditions made for an eerie backdrop. We kept to the windward crest, passed a small grassy area, and continued onward. Suddenly the trail became very rugged and seemed to go downward a bit. Up ahead was a small gully with a tiny waterfall. Then, I didn't like what I saw. 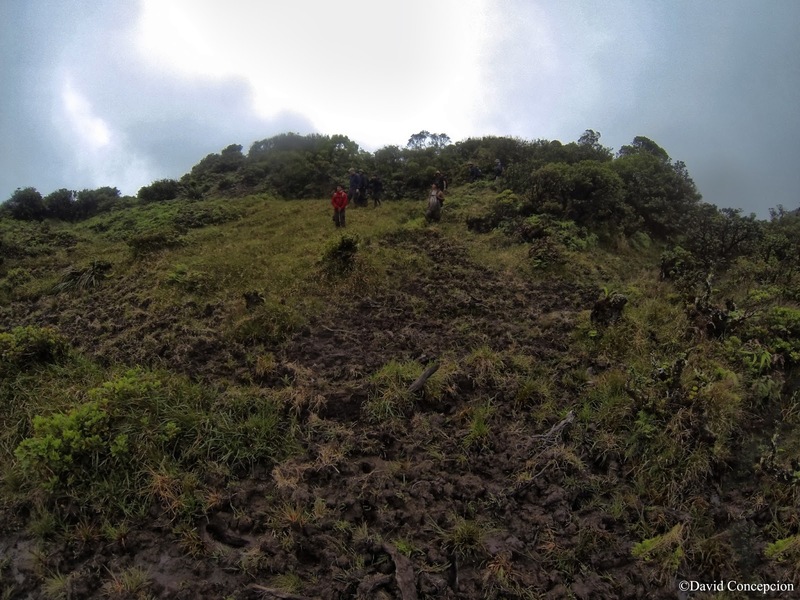 The trail continued forward but also nearly straight down. This wasn't the correct way. The KST does not do this at all. 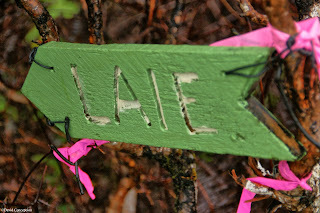 The strange thing was that there were fresh pink ribbons tied, making this a marked trail. Back we went to the swampy marsh. 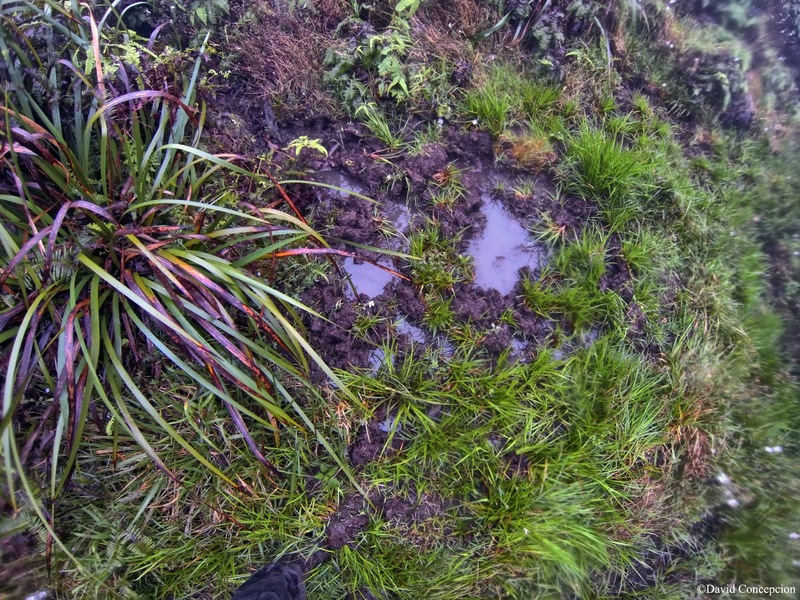 Once on the grassy area again, we went leeward, right in the heart of the muddy marsh to look for signs of a trail. Sure enough there was and was also marked with trail tape. 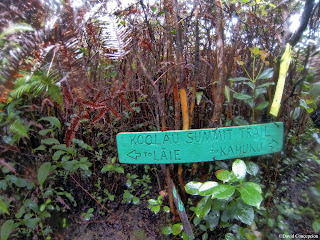 We followed this and it appeared to be the correct way since the trail was back to it's typical contouring profile. 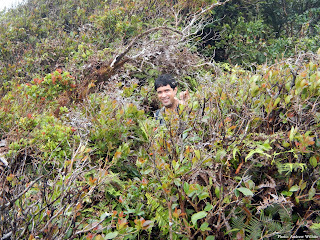 We were confident that we found the summit trail. All of that would soon be thrown out the window about a half hour after we left the marsh area. 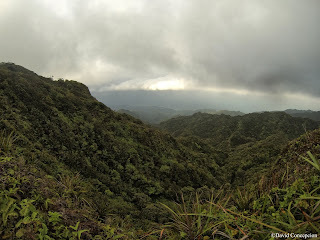 The clouds lifted very briefly to reveal the Wahiawa plains and the Wai`anae Mountains directly in front of us. 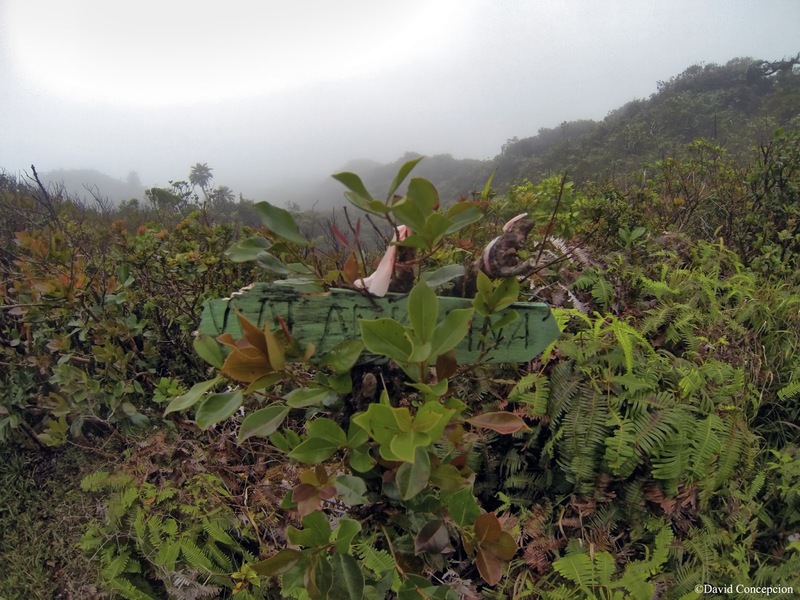 Below, the trail followed a leeward ridge line heading towards that area. Turns out we were going down the Kawailoa Trail. Darn. We backtracked to the marsh once again and an hour was wasted. 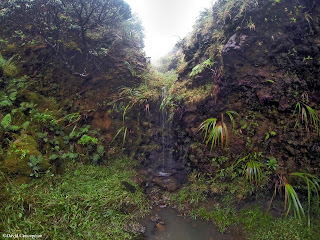 Growing frustrated, we decided to go back to the waterfall again. Andrew would scout farther ahead on that steep trail just beyond the falls, but later would tell me that the trail just keeps heading downward. It was definitely some unknown windward ridge trail. Kawailoa Windward perhaps? Back to the swamp we go. 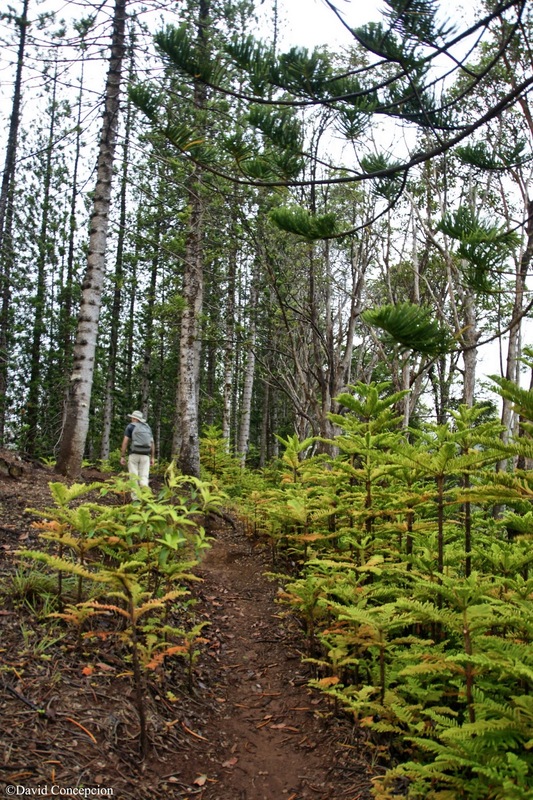 Demoralization filled our heads and with no answer in sight, we made the call to go back to La'ie. As we were making the short walk back, I thought about the segment between La'ie and Pupukea. What if we just make a long shot for Pupukea? We came up La'ie and didn't want to waste it for nothing. 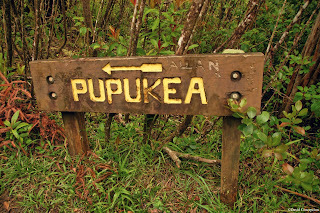 Andrew agreed and as soon as we reached the La'ie terminus, we went straight ahead along the KST northwest towards Pupukea. It was around 12:30pm and mean't roughly 6 or 7 hours of daylight left. Would we make it in time? 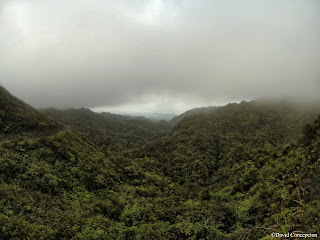 The white out conditions remained with us and while initially the KST remained the same with it's uluhe filled hills, I kept thinking about the wrath of the strawberry guava trees that battered intrepid hikers for decades. This segment would be after all, the worst of the entire KST as far as overgrowth is concerned and I would end up agreeing at the end of the day. About an hour or so after La'ie summit, the guavas did come out in full force. From here on out, this would be our environment we had to deal with. The guava thickets were so dense, we had to probably expend 4 times the amount of energy to plow our way through. 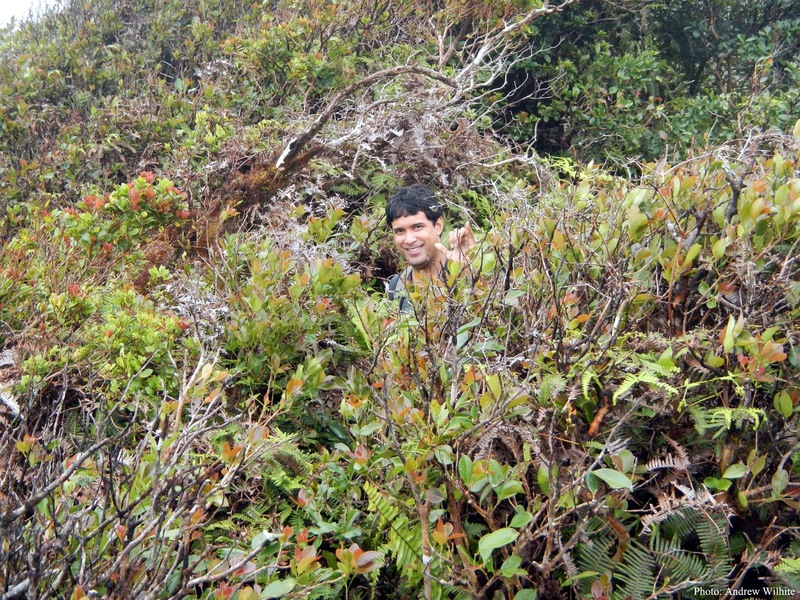 Andrew remained at the ramrod position, exposing him to most of the blunt of the thickets. Even as I followed him, it wasn't easier at all for me. We had to bend our heads down like we were running backs of the NFL. For this section, having an actual football helmet probably wouldn't be a bad idea! Safety goggles would be wise too as every branch protruding towards our face would appear to gouge our eyes out. The farther we progressed, the thicker the walls on both sides thickened. Our shoulders began to hurt. A real football player would probably fare better in these conditions than us. It was so bad, but we were committed to finish. We were in complete silence as the only sound we heard was the rattling of each guava branch as we pushed and shoved foward. The next hour or two would be hell. 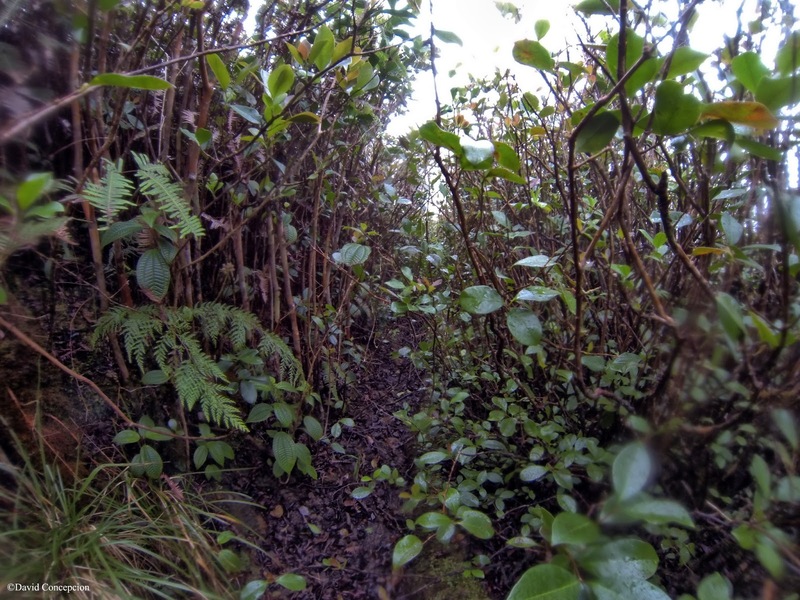 The already thick guava thickets just kept getting THICKER! Push and shove! Push and shove! Go! Go! Go! When will this end??? A short while, we came upon a sign. After a never ending battle, the guavas opened up to a WIDE open grassy area with a benchmark on it! "Hina" it read. We did it! 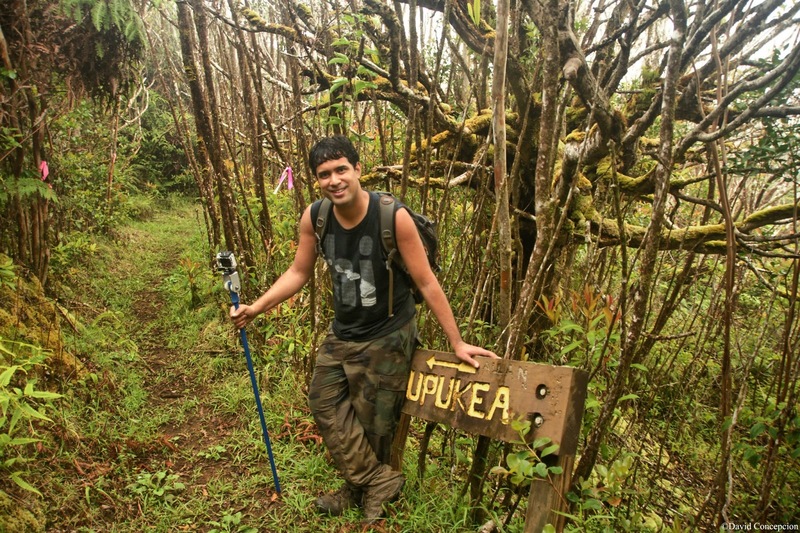 We made it to the terminal point of the Pupukea Trail. We were in joy as we ran down a freeway of a trail, thanks to HTMC's recent clearing! This was like a sidewalk compared to what we were enduring hours ago. 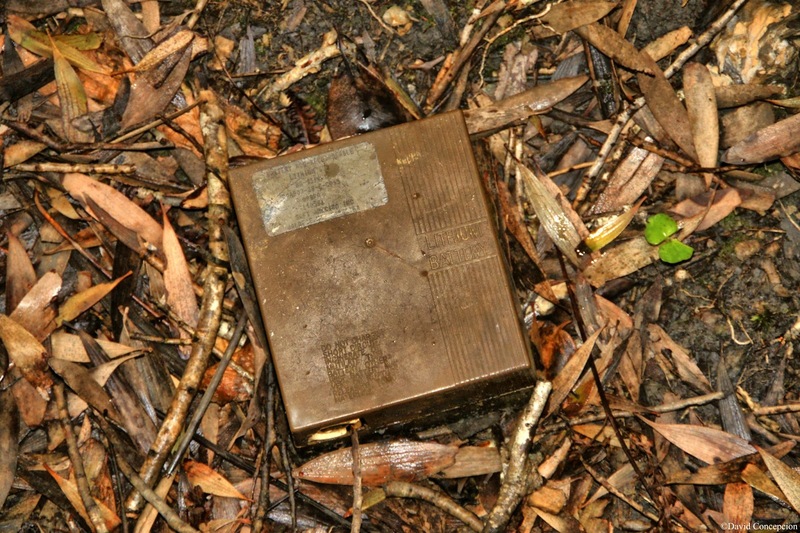 We came across some battery packs strewn on the ground. 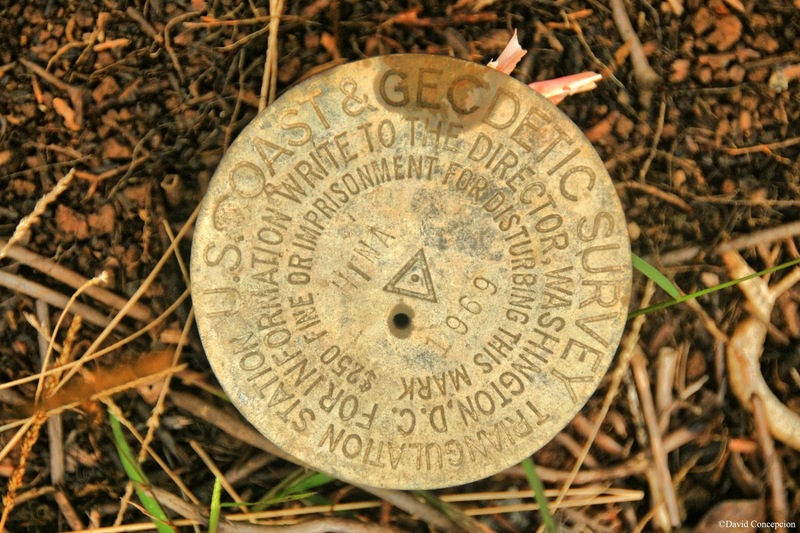 Wondered what they are used for and what they are doing laying around on the trail. 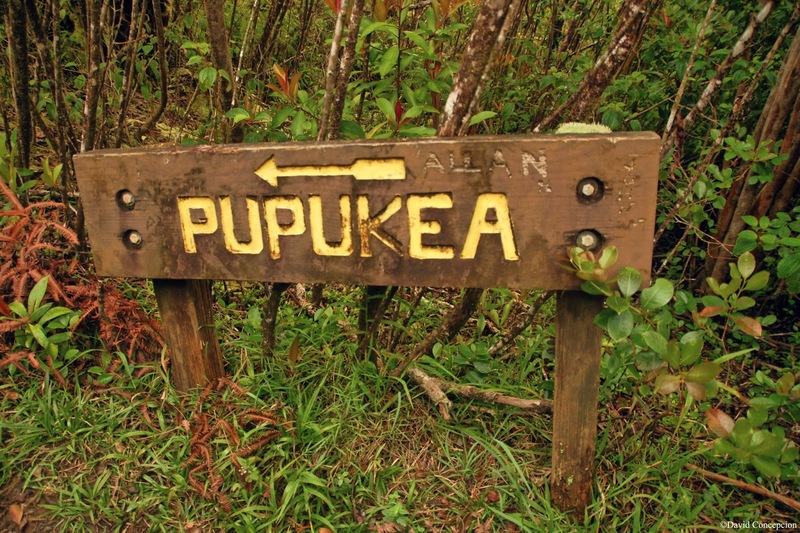 We came to a signed junction with a big sign that read "PUPUKEA". The side trail heads for an overlook, but since we had no view and fast diminishing sunlight, we skipped it and continued downward. 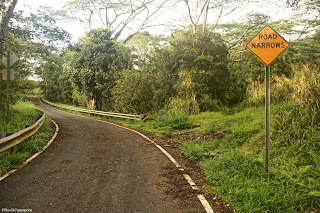 Another hour passed and we were soon on the paved road. 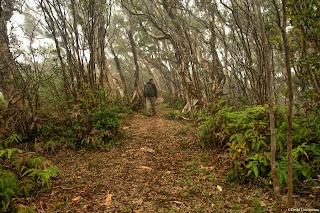 We discovered as we were making our way down this road, we were not alone. Two groups of people were also going down. 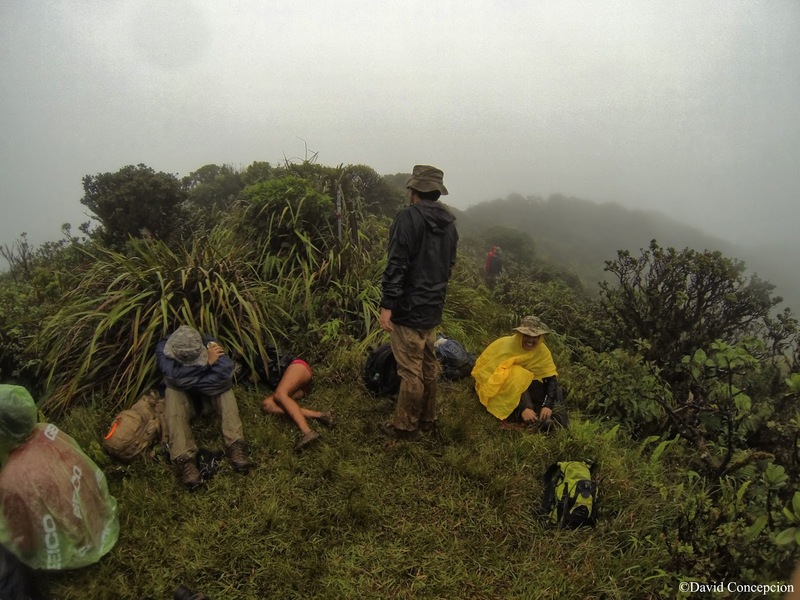 One group were hikers, the other some runners. I know for one thing, we looked like we just finished up Warrior Dash! We passed by a picnic table. An older lady was sitting at the table with her dog. We asked how much longer to the Boy Scouts Camp and she replied that we had 2 miles to go. Almost there! The group of people disappeared into the distance. We left the lady with the dog behind but she would later catch up to us. We were that tired. Soon, we were alone once again as the sun began to set. In the distance, we could make out the Pupukea HECO windfarm. We walked the final mile in the dark to rendezvous with Andrew's Fiancee at the end of Pupukea Rd. She drove us to La'ie and then to Hau'ula to fetch our cars. This is indeed a decision to remember.